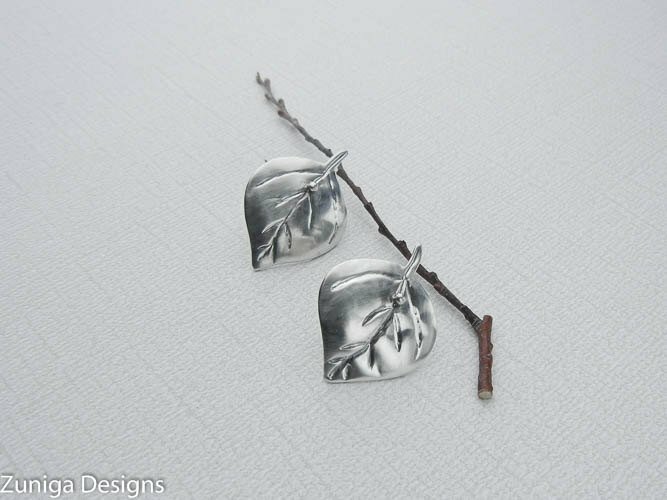 Aspen Leaf Earrings, 3/4″ x 1-1/8″, 21mm x 28 mm, Approx Size, Silver Hammered, Ear Post. Nice gift for Mom. I created these one of a kind sterling silver Aspen leaf earrings for those who want to wear an earring with a post back. These earrings are elegant and make a dramatic statement in silver. I use sterling silver sheet metal to fabricate the leaves and chase the lines of the leaf veining with chasing tools then hammer to give them dimension.